Nice, thanks for reporting! I'll wait for the stacking deals to bite, but glad these are back! Just bought $150 of PSN credit for $120 at my Kennewick Fred Meyer before the coupon ends. Normally I'm an Xbox man, but I have lots of Uncle Phil credit already. Happy days are here again! Can't wait for stackable deals! Good news everyone ... the prepaid GC's are back at Fred Meyer!!! New coupon for this week, no stacking deal yet. Do any of you think FM is going to stop selling games? There's a lot of games they have on clearance right now. Not just old titles, either. It's near fire sale level. You don't think "4X gas rewards on gift-cards" isn't sweet enough? If your local FM hasn't already ditched their Electronics dept, then I'd say they're downsizing the dept, especially in the areas of glass-enclosed display racks along the wall (for games) and CD's/DVD's in the aisles. I'm sure portable electronic accessories, new phone activations, and MAYBE cheap TV's, make up most of their sales, so dumping all of those quickly-depreciating clamshell cases makes sense. With that said, release-day games DO drive traffic into the stores, and I'm sure those games help drive game-accessory sales as well, so as long as the item is less than 1-year-old, then there's no need to completely stop selling games altogether yet. In my opinion, there are a lot of video game and movie titles they simply stock way too many of for how few they sell. At one store I used to go to before I moved, they had 50-60 copies of one of the Halo titles that just collected dust for months on end. The stores I've been to lately all seem to be overflowing with Captain America and Force Awakens Blu-rays. They would also have those $100+ collectors edition video game boxes just sitting on top of the cabinets and no one would ever buy them. It might be good for them to shrink the electronics section stock, but I'm not sure what they'd replace the empty space with. 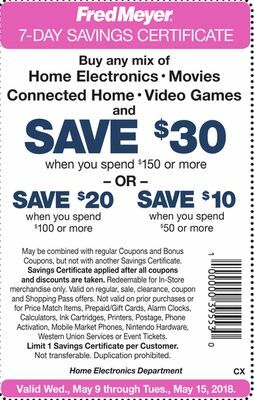 New $10/20/30 savings certificate valid for 3 days this weekend ... just in time for massive XBL & PSN sales! 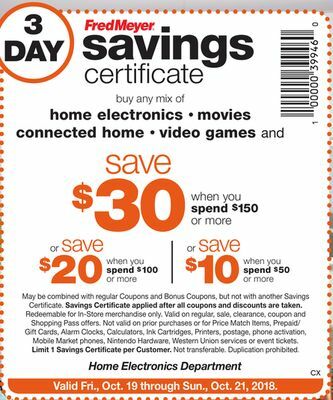 Another $10/20/30 savings certificate valid for 3 days this Father's Day weekend ... it feels weird to have so many options! P.S. Plan for a long stay when you go ... lots of good deals on "man food", tools, etc. It's gonna be a long hot summer, but keep cool inside by playing with your PS4 or XB1! If you're new to this thread, be sure to read the FAQ (at the top of this thread) for which gift-cards can be purchased with this savings certificate. I didn't see this question covered in the FAQ. 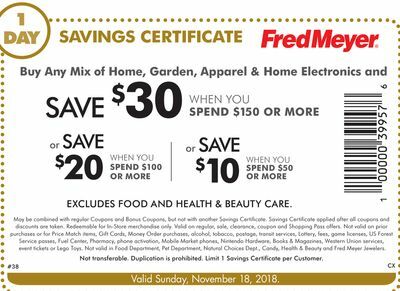 Can you pay with Fred Meyer gift cards? I don't quite know ... there's a chance it "should" work (for any Kroger GC) because they're not GC's from MS/Sony but rather accessories. It's probably more dependent upon well you sweet-talk the associate behind the Electronics counter. I was just thinking I needed some more Xbox money the other day. Guess I'm going to Fred Meyer tomorrow! I just got back from my local Fred Meyer and they also applied a 10% Off coupon after they scanned my Fred Meyer rewards card. I didn't ask for the discount; dude just scanned a coupon behind the counter as soon as I scanned my card. I'm thinkin' Friends & Family must be back! First they took off the $10 off $50, then they took off the 10% ... and suddenly I was buying $350 in Xbox credit at a 70% rate. And BTW, unless you pay with cash, they're already tracking your CC or checking account # ... giving them a Rewards account just puts a name to a number. 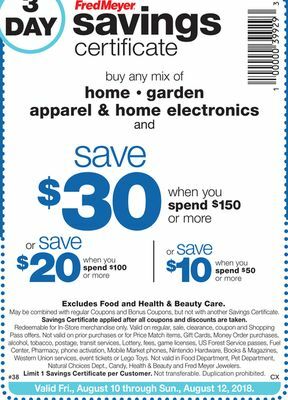 Save 20% on Home and Apparel Merchandise when you make a $20.00 or more Food Purchase. Offer includes Home Electronics. Offer excludes Health and Beauty Care, Greeting Cards, Live goods, Outdoor Floral, and Cosmetics. Download the coupon from August 29-September 3 and redeem from August 31-September 3 ONLY. 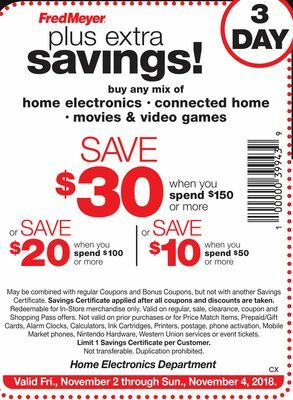 What's not stated in this coupon is any limit on how much you can save ... so as long as you buy $20 in food, you can also buy $2000 in Xbox/PSN credit @ Home Electronics! So to be sure I understand this, I need to buy $20 worth of food when I buy my PSN cards?? 80 bucks for a hundred? I guess that means I should just take my food to the electronics department, since my Freddy's has their cards behind the counter. Or am I missing another coupon? This Friday through this Sunday, $10 off $50 is back! It was like pulling teeth to get this to work thanks to an uncooperative employee. The cards hanging in the electronics department did not work on the coupon. Took a lot of back and forth before he admitted they had a different version hidden behind the counter that Fred Meyer "owned" as opposed to the hanging ones that they don't. He admitted those ones work for the associate discount, so I convinced him to try those, and they did work. I don't know what the difference is on the back because I didn't look at the ones I grabbed off the rack, but they look identical on the front.  Looking at the pic in the OP, they definitely do not say for Display only. So I guess at least my store does not have display only cards on their racks. Oh, I can confirm Fred Meyer gift cards can be used to purchase them as well. Did you go to the Eugene store? They gave me a ton more hassle than usual and cited a guy who came in the night before and paid with gift cards. I eventually got them to do it, but not without a lot of dirty looks and multiple manager calls. Not mad at you, just their weird reluctance to honor a deal we've all been getting for years. Itunes gift cards go on sale and no one bats an eye, but they were treating me like I was stealing from their personal stash. Ha, small world. It probably didn't help that one of the gift cards I tried to use was declined, saying zero funds or something like that, which aggravated me since it should have had $100 on it. The guy then tried to tell me it was probably expired, which I had to inform him it specifically says funds don't expire right on the card. The employee was clearly annoyed someone was actually in the electronics section at 9:30 at night wanting service, as he wasn't doing anything when I walked in. Sorry about that! My grandma has been giving me a gift card almost every month for some reason (I think she thinks I'm starving or something) so I finally decided to use some of them on something. I never shop at Fred Meyer, so they've been piling up. where is the coupon? i couldn't find it in the ad when i went today. i want to use an original coupon instead of the shared copy posted here (less suspicion by employees). Click on my Fred Meyer link above, then scroll down to the ad that says "3-Day Sale." There are many inserts at Fred Meyer's this week, but that will show you which one to look for. original ad to look for in stores, if you're so inclined. Here we go with a ONE DAY coupon good only for Sunday, Nov. 18th, but I have a feeling we’ll see other coupons soon! Looking at the pic in the OP, they definitely do not say for Display only. So I guess at least my store does not have display only cards on their racks. According to associates I’ve talked to, the shelf-hanging FOR DISPLAY ONLY cards are supposed to match the stock in the drawers, so that when they’re out of $50 PSN cards, for example, then the $50 shelf tags should get removed. When in doubt, just say you want the cards that match the UPC codes on the FM-printed price sticker above the hanger. BAD NEWS ... they’ve gone back to stocking Fastcard GC’s behind the register. At 1 store, neither the shelf tag nor the GC had Fastcard’s brand (just obvious white space in the corners), but neither XBL nor PSN cards allowed the coupon. At the 2nd store I went to (in a flurry of sad emotion), they’d just remodeled & don’t stick GC’s behind the register anymore. Instead the employee pointed to Fred Meyer’s own gift card rolling 3-sided display with a “get 2x has rewards” sign on top. And I already knew I was in trouble because the “display only” shelf tags (at the 2nd store) had Fastcard’s brand on the back where the 1st store’s had blank white space ... but the shelf tags were otherwise identical in instructions, fonts, UPC code, etc. If I had to guess, I think Kroger has negotiated a deal with Fastcard for all their GC’s, but some stores still have unbranded cards from when Kroger was activating some GC’s themselves.